We are right in the middle of vegetable-planting season, the sun is shining, and we’ve wanted to grow our own veg for a while now, but the thought of knowing where to plant them, how far apart the different vegetables should be, and how long they need to grow can become daunting if you plan on doing more that one at a time. Infographic and embed code below. Click here to download the vegetable growing cheat sheet for print and mobile. Lucky for us all, we’ve been working on a solution to this problem. Good to be Home’s downloadable Vegetable Growing Cheat Sheet is a complete chart of all the vegetables you may want to grow this summer. Since this guide was first produced we’ve been beavering away and have come up with an interactive version of the infographic that lets you choose your climate, what you want to plant and where you want to plant it. You can then create a personalised version of the cheat sheet to use at home! Click the START button below to have a go! 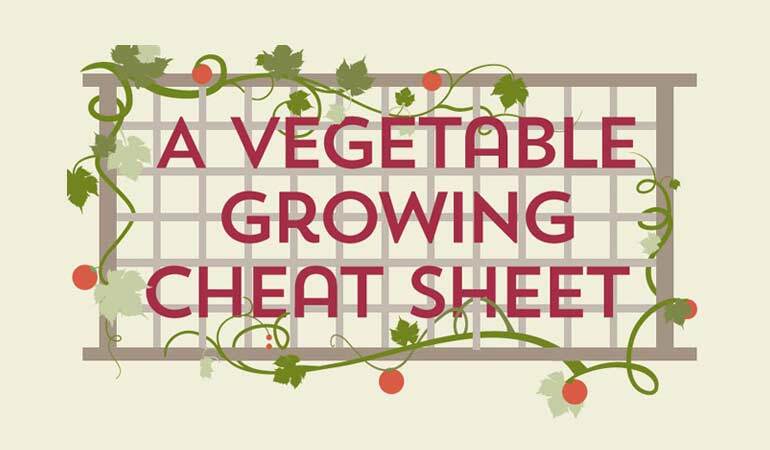 Click here to download the vegetable growing cheat sheet for print and mobile.